Meet Sally! 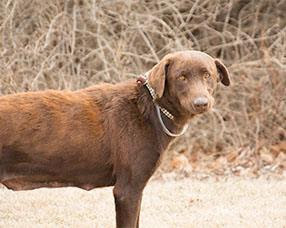 Sally is a 4 year old Labrador Retriever mix. She's a beautiful chocolate with a touch of copper color. 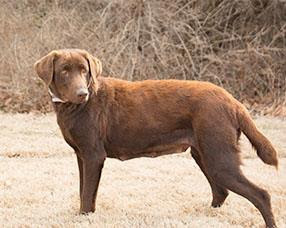 Sally is small for a Lab at only 52 pounds. Hi, I'm Sally! 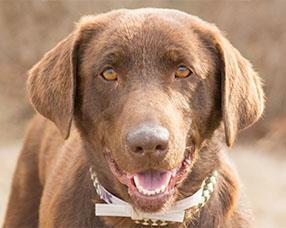 I'm a happy, adorable Retriever, Lab mix weighing about 52 pounds and I'm looking for my fur-ever home. I was brought here by my last owner who could no longer care for me which made me pretty sad at first, but now I see that here I have the best chance at finding my perfect peeps and I've been shown so much love as a Waif! I know it won't be long until I find the right place for me. I'll do grrr-eat in home with children or other furry friends but let's meet before heading home to get an idea of how I might do. I have a pretty moderate energy level so I'll be the perfect companion to snuggle up with for a relaxing night in. I'm a big girl who will still need her exercise so when we do get active let's get out and explore the world on a walk! The peeps here say I do pretty well sticking right by your side on my leash. I'm eager to learn all the new things you have to teach me and know it won't take too long because I'm super smart. With some training and extra motivation from praise or yummy treats, I'll learn exactly what you expect from me in no time! I can't wait to show you how much love and affection I have to offer. I hope you'll come by soon to see how great I really am! Sally's adoption ID number is 30750036. Hope she finds a home soon. Beautiful. What a pretty face! She sounds like the perfect companion and I hope she finds her home very soon.